The EUR/USD is trading lower today on light holiday volume as the Dollar strengthens across the board. Due to the relative lack of economic data and activity during a holiday-shortened week, it seems the Dollar is reverting to the positive momentum it has displayed throughout most of the month of December. However, the EU did release its M3 Money Supply number, which turned negative for the first time since the inception of the global recession. Hence, the ECB may be discouraged from tightening liquidity too soon since QE measures aren’t having their desired impact on the money supply. Meanwhile, U.S. will release its Chicago PMI number in a few minutes. A strong Chicago PMI figure could help the Dollar add onto intraday gains as investors gain confidence in the U.S. economy. However, the EUR/USD may refrain from taking out important technical levels in either direction since the lack of volume and data may discourage investors from making bold decisions. That being said, momentum does appear to remain to the downside in the EUR/USD as the currency pair approaches previous December lows. Technically speaking, the EUR/USD faces multiple downtrend lines along with the psychological 1.45 level, 12/29, 12/23, and 12/18 highs. Hence, some challenging near-term topside technicals are in place due to the EUR/USD’s recent deterioration. As for the downside, the EUR/USD has technical cushions in the form of our 1st (off chart) and 2nd tier uptrend lines along with intraday and 12/22 lows. However, the EUR/USD still trades well below our 3rd tier uptrend line that runs through July lows, meaning the currency pair could be in for more losses over the medium-term towards the psychological 1.40 area. The Cable was unable to hold onto its psychological 1.60 yesterday and proceeded to set new December lows as the Dollar strengthened across the board. We notice the USD/JPY trading higher and the EUR/USD moving south, indicating the Dollar’s positive momentum is back in play. Investors are likely indicating a preference for the Dollar since the Greenback’s uptrend has been positive throughout most of December, and with the data wire relative quiet for the holiday season investors seem to be reverting back to the Dollar’s more dominant momentum. Meanwhile, investors are waiting for America’s upcoming Chicago PMI release. The UK data wire is quiet until tomorrow’s Nationwide HPI figure, so added emphasis may be placed on the Chicago PMI data should it surprise in either direction. That being said, activity could remain in a subdued state as investors take off for the New Year holiday. Regardless, investors should keep an eye on the Cable’s interaction with September and October lows should they be tested. Technically speaking, the Cable’s large pullback this month has sent the currency pair below some key technical levels. Hence, it’s possible the Cable could be entering a more protracted downturn. However, we’ll have to see whether the Dollar’s present weakness can accumulate and send the Cable back above some downtrend lines. If not, the Cable does have some technical supports in the form of September and October lows. 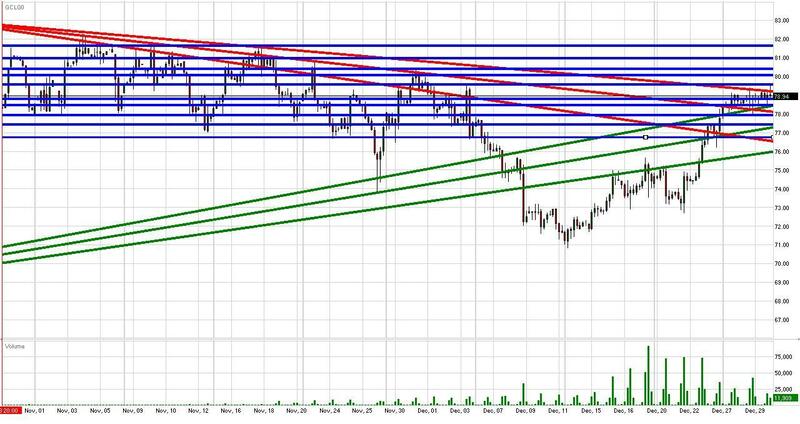 As for the topside, the Cable faces multiple downtrend lines along with 12/29 and 12/22 highs. The Dollar is continuing its strong performance against the Yen as investors speculate that Japan Airlines will need to file for bankruptcy. This piece of negative corporate news is fueling the Yen’s weakness as investors expect more tough times ahead for Japan’s economy. Furthermore, the Yen has already been placed at a disadvantage by the BoJ’s recent promise to fight deflation, indicating a loose monetary policy for the foreseeable future. That being said, the USD/JPY may refrain from tackling too many topside barriers due to light activity in the wake of a holiday-shortened week. Investors that are in the game today are currently reacting to a stronger than expected Chicago PMI figure. Another positive U.S. data release could help the USD/JPY tack onto intraday gains as the session progresses and investors digest the negative news concerning Japan Airlines. Meanwhile, the data wire will continue to quiet down with weekly U.S. Unemployment Claims on deck as usual. However, China will slip in some Manufacturing PMI data on January 1st, and any surprising developments could have an impact on the Yen as investors return to action next week. Technically speaking, the USD/JPY has overcome more key technical levels, including our previous 2nd and 3rd tier downtrend lines along with October highs. The currency pair is presently battling September highs. The USD/JPY’s eclipse of our downtrend lines is sending a message that the currency pair could be in for further gains over the medium-term towards the highly psychological 100 area. As for the downside, the USD/JPY has multiple uptrend lines serving as technical cushions along with 12/29, 12/24, and 12/21 lows. Furthermore, the highly psychological 90 level could serve as a strong support area should it be tested. Gold has sunk back below its highly psychological $1100/oz level again, and is dipping towards previous December lows as the Dollar experiences another broad-based rally. Investors are favoring the Greenback once again due to a holiday-shortened week and a sparse data wire. Investors seem to be favoring the more dominant momentum during the month of December, or a stronger Dollar and weaker gold. Investors did receive Chicago PMI data today, which printed stronger than analyst expectations. More positive economic data only strengthens investor confidence in America’s economic recovery, a positive catalyst for the Dollar and negative for gold. Meanwhile, the data wire will continue to quiet down with Britain’s Nationwide HPI and America’s weekly Unemployment Claims being the only credible releases during tomorrow’s trading session. Hence, gold and the Dollar may continue to favor their present momentums. Technically speaking, gold has multiple uptrend lines serving as technical cushions along with 12/18 and 12/23 lows. Our 3rd tier uptrend line could prove to be an important trend line since it runs through 10/28 lows, or the $1025/oz level. As for the topside, gold faces technical barriers in the form of 12/28, 12/21, and 12/15 highs along with the psychological $1075/oz and $1050/oz levels. Crude futures are consolidating below the psychological $80/bbl level as the futures stare down our 3rd tier downtrend line. Our 3rd tier carriers some added weight because it runs through previous 2009 highs. Therefore, a breakout beyond our 3rd tier downtrend line could yield a retest of 2009 highs over the near-term. Meanwhile, the Dollar is registering solid gains against the Yen and Euro today, normally a negative catalyst for crude since a stronger Greenback makes Dollar-based commodities such as crude a more attractive import. However, the Chicago PMI release printed stronger than expected, a positive development for the U.S. economy and consequently the outlook for crude’s demand. Hence strong economic data seems to be counterbalancing a strengthening Dollar, allowing crude futures to consolidate as investors contemplate overtaking the psychological $80/bbl level and testing 2009 highs. That being said, activity could cool down since we’re in the midst of a holiday-shortened week. All that’s left on the board for the U.S. is tomorrow’s weekly Unemployment Claims release. Therefore, crude may continue to consolidate below $80/bbl level until investors return from vacation next week. The S&P futures are recovering from intraday losses after the Chicago PMI figure came in stronger than analyst expectations. Today’s encouraging U.S. econ data is yielding losses in the EUR/USD and gold along with gains in the USD/JPY, positive indicators for the S&P futures correlation-wise. Yesterday’s CB Consumer Confidence number turned out to be a non-event after printing just around analyst expectations. The data wire will remain relatively quiet during this holiday-shortened week. The U.S. will release its weekly Unemployment Claims figure tomorrow as usual. Another decline in Unemployment Claims could yield further gains in the Dollar and U.S. equities. That being said, investors may want to keep an eye on the Dollar’s interaction with key technicals. Any sudden, game-changing movements in the Dollar could have an immediate impact on U.S. equities due to correlative forces. However, activity should remain subdued as investors take off early for New Years Eve. On another note, investors should check in on China’s Manufacturing PMI release New Years Day. It’s a bit odd that such a data release will print on New Years Day, and a surprise in either direction could impact the markets as trading kicks off next week. Technically speaking, the S&P futures are still locked into their medium-term uptrend after setting consecutive higher lows while breaking out of previous 2009 highs. Furthermore, the futures have the highly psychological 1100 level serving as a technical cushion along with our 1st and 2nd tier uptrend lines. As for the topside, the S&P’s only foreseeable near-term technical barriers are previous 2009 highs and the psychological 1050 level.